The Rat Horoscope 2016 forecasts that if you follow your intuition, it will prevent you from committing unavoidable mistakes in your life. You will make remarkable progress in expanding your social circle, and it will help you to widen your scope of operations. In 2016, the Chinese rat zodiac sign should focus on completion of the projects which are pending for the last couple of years. Be determined to execute your plans which you have worked out earlier. Last year you had faced some problems in your relationships. Year 2016 is ideal for building harmonious relationships by resorting to mutual discussions with partners to clear the lingering mistrust. By end of the Year of the Red Fire Monkey you will establish good friendships in your professional environment by your communication skills. This coupled with your capability to take right decisions based on logical thinking will assist you to make major changes in your organization. Rats, do not ignore the offers of help from your friends and associates. In fact this will help you to grow in life. Read about Rat symbolism & Mouse meanings. The Chinese astrology predictions 2016 for the rat zodiac sign foretell that the steps you have taken last year to harmonize your relationships will start yielding results during the early part of the year. Your relationship with your spouse will be full of love and compassion. There will be peace in your bonding and enough passion to ignite your love life. This is an excellent year to plan for a pregnancy. Single Rats should be aware of the requirements in their partnerships which they are likely to forge. They should be compromising in their ideals if required during the first quarter of the year. The 2016 Rat horoscope forecasts also show that during the middle of the year, the relationship with your spouse becomes stormy. There will be major differences of opinion between the both of you and the differences may be irreconcilable. It requires plenty of sympathy and understanding on the part of both partners to resolve the situation. The Chinese zodiac predictions 2016 for the rat forecast that situations in your profession and business fields will get tougher during the year and you will be forced to develop lot of patience to deal with the problems. You can move ahead with your strong determination. There is a need to build a powerful and united group of dedicated professionals to achieve your business goals. The Rat 2016 horoscope predictions say that though you are able to accomplish your goals independently right now, it is wiser to seek the collaboration of other people in your pursuit of your objectives. Build new relationships in addition to the existing ones, and take expert advice if necessary. Chinese zodiac 2016 predicts that the planetary positions are helpful in improving your ability to overcome difficulties. Try to complete the pending projects of last year by following them up with stubbornness. Financially the year of the monkey 2016 will be an excellent year for the rats as planets have good aspects and your efforts will yield profits. Your financial skills will see you overcome any obstacles on your road to monetary success. Your money flow will be smooth and you will deal with confidence all the minor hindrances. It is time in 2016 to clear old loans and build a sensible budget to match your expenses and income. Rats, financial needs of the family and yourself will have to be catered for, and you should come up with a reliable strategy to deal with the situation. The 2016 Chinese horoscope predictions for the Rat forecast that the beginning of 2016 indicates delicate health, and you should take frequent breaks from the stressful routine to remain in shape. You will regain your energy and emotional fitness by May 2016 and your fitness level improves drastically. Relaxation techniques will help you immensely in maintaining your health. The Rats should focus on their physical fitness as well as the way they look. Regular exercise regimen will help you in reducing your work related tensions and will make you more optimistic. It will improve your energy level and will improve your immunity to face diseases. The last quarter of the year 2016 turns out to be excellent for the Rats. Your relationship with loved ones becomes more delightful and peaceful without major obstacles. However you should anticipate any hiccups and nip them in the bud before they escalate. You will realize your strengths and shortcomings which will result in a better understanding of the relationship. The Feng Shui yearly forecasts 2016 for the Rat foretell that you will be in a position of authority in the coming year. 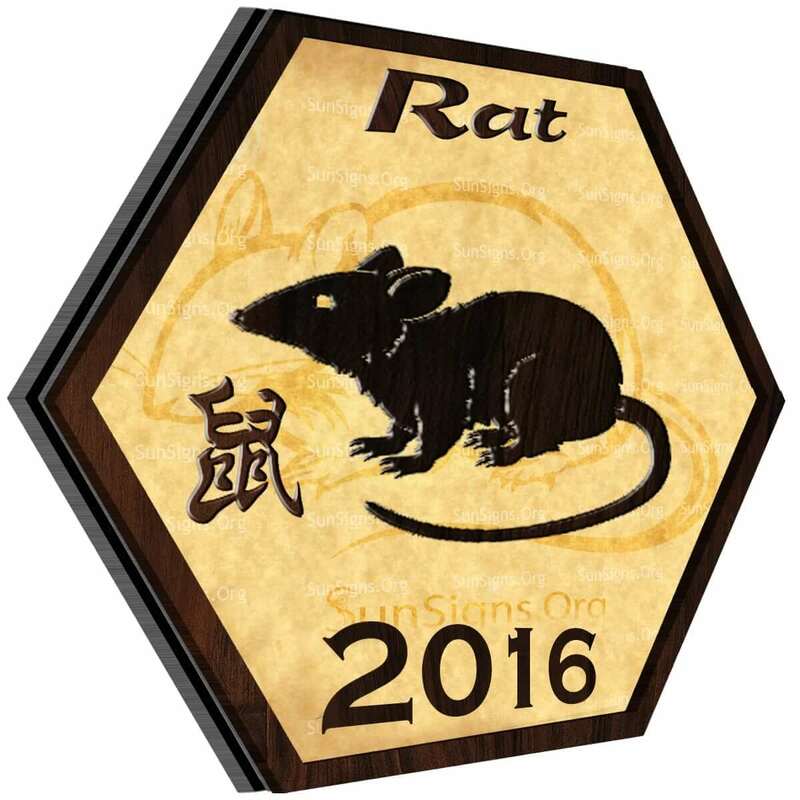 To conclude, the Rat horoscope 2016 forecasts that this will be an extremely favorable and promising year. This is the right time to start planning the basics of your projects and start implementing them.